Is Physician Leadership Right for Me? When you started your career in medicine, were you thinking about eventually making the transition to a leadership role? Many physicians begin their careers knowing they want to take this step, and as a result pursue degrees like a Master of Public Health or Master of Business Administration, in addition to a Doctor of Medicine. However, only about 5 percent of the 6,500 hospitals in the country are led by physicians. Issues like patient outcomes and safety, reducing readmissions and quality of care all require the expertise and leadership of physicians, according to Medscape. The role physician leaders play in providing high-quality care helps the facilities that employ them, as well as their patients. One study found that higher performing hospitals had CEOs who were also physicians at their helms. This can give hospitals a competitive edge. Because these leaders have been in the trenches of a hospital’s core business — providing patient care — they are better equipped to collaborate with other hospital leaders to ensure patients get the right care, every time, notes the American Association for Physician Leadership. A deep understanding of both the healthcare system and how providers and managers function within this environment. The ability to align ethical and professional standards to ensure there is always a responsibility to the patient and community while also fostering a commitment to service and lifelong learning. Having clear and concise communication skills. Physician leaders must be able to communicate clearly with internal and external audiences. A knowledge of business principles and how they can apply to the healthcare environment. The ability to inspire excellence. 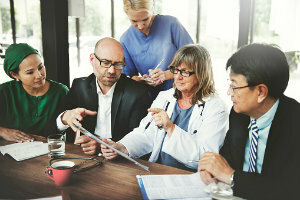 Successful physician leaders must be able to create and achieve a shared vision, while managing change to achieve that vision as well as other goals. Have a clear understanding of his or her strengths, weaknesses, blind spots and hot buttons. Have a clear, compelling vision and the ability to create effective plans for an organization’s future. Have people skills — the ability to listen, mentor, give feedback and energize staff. Have the ability to make decisions, drive creativity and results. Get additional training. Additional education will give you insights into the business side of leadership and expose you to topics like data analytics, predictive modeling and how different roles contribute to the success of clinical care. Join professional organizations to network with colleagues. Find a mentor who can provide advice and constructive criticism. Take time to speak with your mentor, ask them how they got started on the path to leadership, their time frame and sources of support they used. Stop thinking in terms of individuals and start thinking in terms of teams. Think of the important role each member of a team brings to the table. This will allow you to execute and innovate faster. Don’t forget about your patients and the care you provide them. It may take more effort and time to become a physician leader, but pursuing a leadership role can benefit your facility, your patients and your career.